The first documented evidence of a castle on the site dates back to 1391, when the castle was the property of the Auel family. At that time a moat surrounded the castle. In 1763, the current baroque residence was erected on the former castle foundation and the moats were filled up. For 200 years, the castle was the property of the lords von La Valette St. George. Marquis Philippe de la Valette St. George, admiral and grandmaster of the Knights of St. John, was the most famous member of the family. He was known for his support of independence for the island of Malta (the capital of Malta, Valletta, was named for him) and for his contribution in stopping the expansion of the Ottoman empire under Suleiman II. Napoleon Bonaparte seems to have slept in as many beds in Europe as George Washington did in America. If you’re traveling on your own and wish to sleep in Napoleon’s bed and in Napoleon’s room, here is your chance! Room 22 is the room. Alas, there’s only a narrow single bed, so a romantic romp would be a little difficult. Napoleon was physically challenged in the height department, and the bed has since been lengthened to accommodate taller guests. The mattress has since been changed, too. Rates include tax, and service. Lohmar is southeast of Cologne. Take the A-3 autobahn south, exit at Lohmar-Nord, go north on highway B-484. A car is the best way to get around the area. A popular wedding venue, the schloss has a lovely chapel with a rococo altarpiece. Schloss Auel isn’t a castle in the grand monolithic fortress sense, rather it’s a lovely baroque baronial manor with some fortification features. Never short on visiting heads of state, former house guests have included Napoleon Bonaparte, Kaiser Wilhelm II, and Tsar Alexander I. The impressive entry hall is filled with Renaissance furniture, and a fine oak staircase leads to the guest rooms. Guest rooms are configured around the castle’s architecture: ceilings can slant, and bathrooms can be tucked around the corner. All are individually decorated, with fine antiques featured throughout. Dining is an elegant affair in the Prince’s Room, as well as a dining area with a wonderful Gobelin tapestry. The schloss also has a casual bar and beer garden. 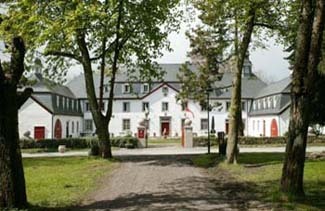 Not located on the popular tourist track, Schloss Auel presents a quiet, unaffected atmosphere. Sleep in Napoleon Bonaparte’s bedroom!.